It's become increasingly clear that biodegradable plastic is not the eco-friendly solution to reduce our plastic pollution problem around the world. Not only can biodegradable plastic not be recycled (in a re-processing plant); when it degrades, it breaks into tiny pieces which, if it finds its way into the oceans, seriously affects marine life. Ethically, polythene producers now turn to a viable alternative polythene product that's not only environmentally friendly, but also suitable for the recycling mix and for subsequent reuse. Certain products require polythene due to the nature of the protection required, rather than labour intensive paper and card. The answer is GreenPolythene. 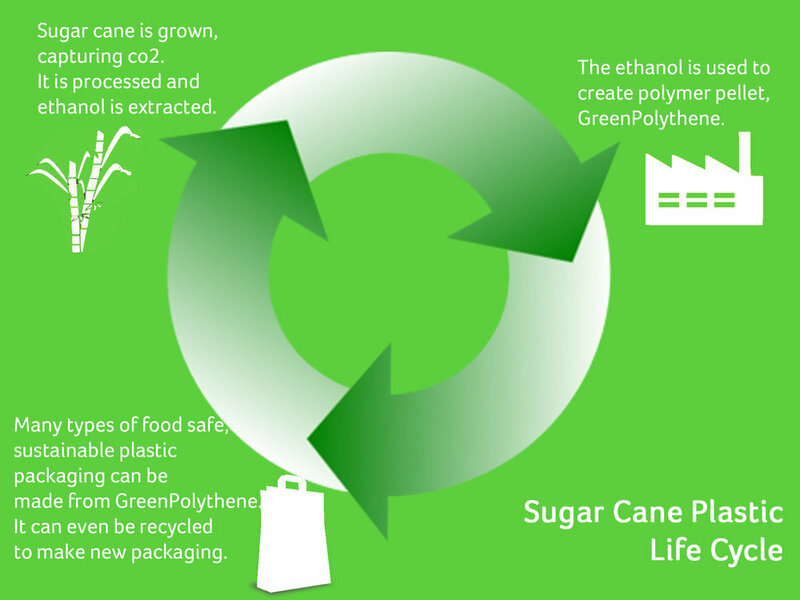 Sugar cane processing results in a waste by product, of which ethanol is used to create a polymer that’s bio-based rather than oil-based (such as crude oil based polythene). During the growth of the sugar cane, the natural process of photosynthesis sees carbon captured. Initially, this raw material is carbon negative. As sugar cane is obviously a plant, it's totally renewable and won't deplete fossil fuels (such as crude oil, used for standard polythene), which is of enormous environmental benefit. The production process inevitably generates carbon through factors such as manufacturing and transport, which means that by the time the bio-based polythene is produced it is actually carbon neutral. The Carbon Trust recently accredited an example of sugar cane based polythene bags as carbon neutral, confirming that it’s possible to nullify the effect of carbon emissions. It’s worth considering some additional key points. The UK uses some 1 million tonnes of polythene films and bags every year. Using fossil fuel polymers to meet this demand costs the planet 2.6 billion tonnes of CO2 annually. By widely implementing GreenPolythene this figure could be drastically reduced. Still at the forefront of people’s minds currently, and rightly so, the concern over the amount of plastic waste, where it goes and how we discard it, remains an important issue. However, there are glimmers of light in the darkness of how we deal with these problems. The most important message to get across is to arm the consumer with the facts, rather than stick our heads in the sand. This shows a clear indication that something is being done to combat the problem of the amount of packaging waste we’re producing. Now we need to be more responsible in how we discard our waste. It’s very easy to jump on the ‘banish the bag’ and ‘ban all plastics’ bandwagon, and simply ‘move’ over to the seemingly much more eco-friendly alternative of paper and card packaging. We run the risk of simply side-shifting the problem that is our throwaway culture, rather than educating the consumer into responsible reuse and recycling. The biggest threat to our planet is simply the amount of carbon we’re putting out into the atmosphere. Increasing demand on paper, card, cotton and jute, in the backlash against plastic carrier bags, results in much higher levels of carbon emitted in the manufacture of these aforementioned alternatives. It’s a fact that a paper bag for instance is 4 times more damaging in its carbon footprint, to that of it’s plastic bag equivalent. Also worth mentioning is the millions of gallons of water required to process wood for pulp and paper production, and additionally similar amounts to process cotton for clothing and bags. The message is clear, more work needs to be done by everyone, to reduce, reuse, recycle. The importance of getting it right, first time. When making plans to create a bespoke packaging design, there may be a thousand ideas running round your mind. Now is the time to get these ideas on paper. Yes, good old fashioned notepaper and pencil. Once you've got an idea of how any or all of these items might appear, then you're ready to get into contact with us to discuss getting the idea made into reality. We will take your ideas, along with any logo files you might have, to produce a digital proof prior to printing. We'll be happy to assist with any suggestions you might require, whether it be to add or remove details, placement of design, or any other additions we might be able to offer. Most importantly, we will check and double check all designs for errors, be it in logo, picture or text, prior to manufacture. The last thing we need is to have to discard an entire production due to an oversight! It might sound silly, but it can happen to the best of us, so we might ask for clarification of specific spellings occasionally! ASDA recently had to scrap an entire run of their 'bag for life' due to a misspelling! Still unsure if this is an intended mistake!! It's been over a year since the UK government brought in the 5p carrier bag tax in England, catching up with the rest of the UK in charging for single use carrier bags in large retailers. There's no doubt about it, since October 2015 there has been a definite surge in carrier bag 'awareness', whether that means simply forgetting your reusable bags and cursing yourself, or indeed refusing a carrier bag when offered one, and struggling along the town centre with armfuls of shopping. We've also seen a noticeable change in demand from the big players in recent years. Tesco and Morrison supermarkets have both recorded drops of around 80% since the charge was introduced. Retailers are also expected (but not legally bound) to donate the proceeds of the charge to good causes. From October 2015 until reporting deadline of May 2016, for example Asda supermarkets donated a very healthy sum of £2.5m to good causes. There are very important additional factors to think about when looking at these statistics. While the net proceeds of the carrier bag charge go to good causes, the VAT payable makes a very favourable sum to Her Majesty's Revenue and Customs. From the full 1st 6 months report published online* we can see that the tax man has pocketed £8.75m. As this is money previously unavailable before carrier bag charging came into force, questions need to be asked as to where this money is being spent. Are we as a nation becoming more carrier bag aware? On personal family experience, the 'bags for life' are being forgotten less these days, but there are always times when a bag requirement isn't considered, or an impulse purchase is made, and the bag charge is incurred. The resulting carrier bag is then added to the burgeoning 'stash' of bags somewhere in the garage, inevitably being thrown out in due course when the pile becomes too large. This doesn't really fall into the eco-friendly requirements we're reminded of when it comes to the 'ban the bag' mob. 1) From all household waste, before the carrier bag charge, 0.2% was made up of plastic bags. 2) Tesco saw an increase in pedal bin liner sales in Ireland of 77% in the first year since carrier bag charging was implemented. 3) WRAP survey from 2005 found that 59% of people re-use all their lightweight plastic carrier bags again, whether it be for bin liner, or re-use to transport shopping. 4) 2014 saw us use 6.5 billion carrier bags. The carbon footprint of this, equates to around 2 hours of flight activity at Heathrow Airport. 5) There is no real risk to sea and wild life from plastic carrier bags. Far greater dangers come from plastic microbeads, nets, ropes, fishing gear and strapping bands. This final fact is the most unnerving. For years we've been led to believe** that plastic carrier bags are solely responsible for killing hundreds if not thousands of marine creatures around the world. This is simply not true. From several news articles at the time, the public have been told that around 8 million tonnes of plastic was making its way into oceans around the world. PLASTIC. Not plastic carrier bags. A Marine Conservation Society report made in 2015 showed that plastic drinks bottle littering was up 43% on figures from 2014. While media reporting focussed on the 'plight' of carrier bags, we took our eye off the ball of the real overall problem of littering and waste. Now the carrier bag charge is in full swing, we can't expect the fee to ever be revoked or removed in the future. However we maintain that the humble carrier bag is still as necessary today as it has always been, and future technologies in creating a cost effective, environmentally friendly bag continue.